We just finished a great read & wanted to share our thoughts with you. There are a lot of “organizing” books out there, and most of them are highly focused on the practical and tangible aspects of the process. New Minimalism: Decluttering and Design for Sustainable, Intentional Living has so much more to offer than just the “how to” organizing info. It feels like they speak our language, when it comes to listening and understanding a client’s specific needs before prescribing what to do and how to do it. 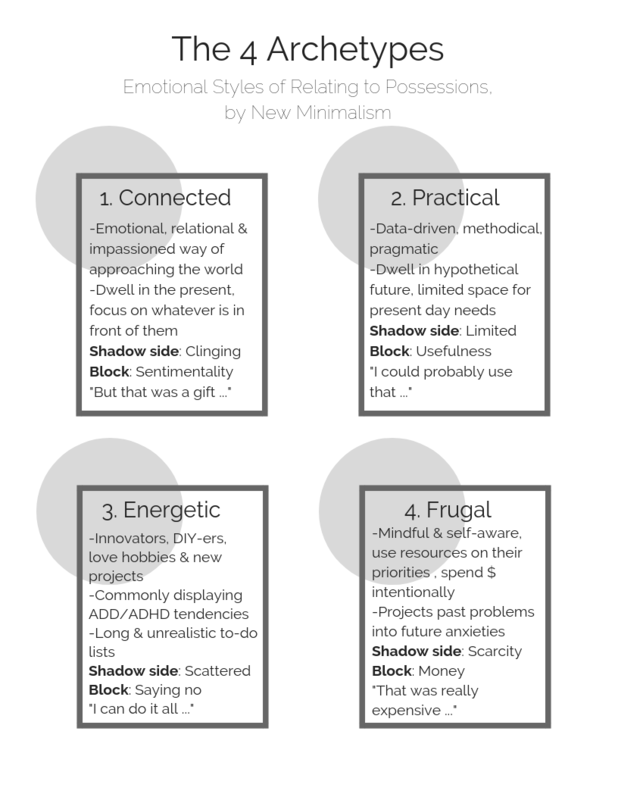 They offer a framework of 4 Archetypes that expound on how individuals personally relate to their possessions. The archetypes are used to help express why it’s hard for a particular person to declutter, while keeping the focus on the positive side of how we relate to our things. This framework can be such a helpful tool when learning your own archetype or the archetype of people you live with. We love the way they offer a process and plan for helping folks declutter and organize, but they do it in a fluid and flexible way that is tailored to each specific client. In our five years of experience, we find this way of organizing is helpful for clients — there is no one right way for everyone to simplify their lives. The gals who wrote this book have a deep appreciation for being conscious consumers, as well as kind to our environment. They even venture to say “ the choices we make in the kitchen, just like the choices we make about our wardrobes, echo through our day and our communities”. We couldn’t agree more with the idea that our choices effect much more than just our own lives and well being. In regards to mail, they preach the same message we’ve been empowering clients with for a long time… “Make sure that as soon as you get your mail from your box or front door, you open all important pieces, then shred & recycle them once they are no longer needed. If you don’t have time to open your mail, we would recommend leaving it in the mailbox until you do have time, rather than bringing it in and not sorting it. Otherwise piles start to grow”. We really appreciate the way these women highlight and credit other professionals in the organizing realm, like Marie Kondo & Karen Kingston. This collaborative posture is one we can totally support. At their best, our homes are a reflection of our hopes, our current values and our history. While having meaningful objects from our pasts can be beautiful, we need to achieve a fine balance, lest we become rooted in our history and unable to move forward into our future. This read is chock full of wisdom about making thoughtful decisions and shifting your perspective. We found ourselves nodding our heads and underlining so many pages. If you want to be encouraged and equipped to live more simply and intentionally, we highly recommend grabbing a copy. We are cheering Cary and Kyle on as they continue to serve clients in the San Fransisco area. Follow them on Instagram to see glimpses of what they do! Grab a copy of their book and stay tuned for their second book, New Minimalism Guided Journal, set to come out in early 2020. They also have a wonderful blog.